In July, the Taste of Chicago closed down for a day due to heavy rain. In the suburbs, storms are flooding streets and basements. It’s a rainy year—the month of June had the third highest rainfall at Chicago O’Hare since records have been kept in 1959. City sewers built to take on storms from days gone by are no match for today’s rainfall that lands mostly on parking lots, streets, and sidewalks instead of being absorbed into fields and patches of forest. What’s more, climate change predictions appear to be coming true—larger storms are hitting more frequently. Basements and streets underwater are a serious concern, but when Superstorm Sandy hit the east coast two years ago, it illustrated that flooding of critical facilities, such as hospitals, can have widespread and possibly catastrophic impacts. 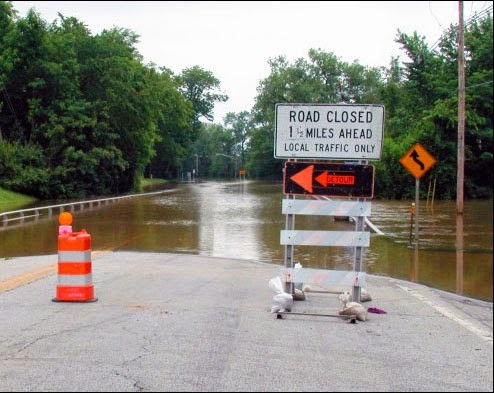 IISG’s climate specialist, Molly Woloszyn, is tackling the issue of flooding from the angle of better preparation and prediction. She is part of a project that is assessing the flooding vulnerability of critical buildings in Chicago, including utility providers, transportation facilities, and hospitals. She is looking at factors like location, elevation, and flooding history of the facility, but also the placement of critical systems, such as generators and potable water supplies. Ultimately, this will result in recommendations on how these facilities can shore up their structures and systems to reduce this risk in the face of future storms. Molly and other project contributors at the Midwestern Regional Climate Center are also dipping into 25 years of data from the Cook County Precipitation Network to connect large rain events with their consequences, such as combined sewer overflows and reports of basement and viaduct flooding. The goal here is to help the National Weather Service make forecasts that are impact-based for the city of Chicago. Updating rain event reports for what constitutes a 5-year storm or a 100-year storm, for example, (meaning the probability of these storms happening is 1 in 5 or 1 in 100 years) is one part of the city’s plan for getting ahead of flooding concerns as detailed in the City of Chicago Green Stormwater Infrastructure Strategy. Planners and engineers use long term rainfall data to make decisions going forward, but the last report was released in 1992 with data up to the mid-80s. By all accounts, big storms are getting bigger and more frequent. More data is key for local decision makers. The Midwestern Regional Climate Center’s analysis of the Cook County data will provide new rainfall thresholds for various sized events over the course of the last 25 years.